On this page are a few photos taken around our home town of Geraldton. We will add more as time permits. The Collie to Narngulu coal train runs on a 7 trains a fortnight programme and generally arrives at Narngulu every 2nd day. Normally the train is hauled by a single P class with 25 XY wagons. 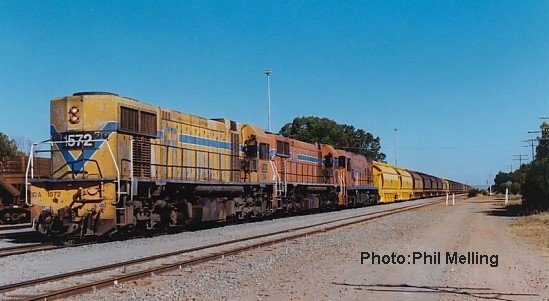 Sometimes the train is used to convey wagons between Perth and Narngulu and as 25xy wagons are the maximum load for a single P a second unit is required. On the occasion featured in the Photo P2015 had failed and due to the load of the train and the failed P class DA1572 & DA1575 were sent to rescue the train. The ensemble is seen arriving at Narngulu on 7 January 1999. Part of the old Geraldton-Northampton Railway (W.A. 's first Government Railway opened in 1879) is still in use today alongside Champion Bay in Geraldton. 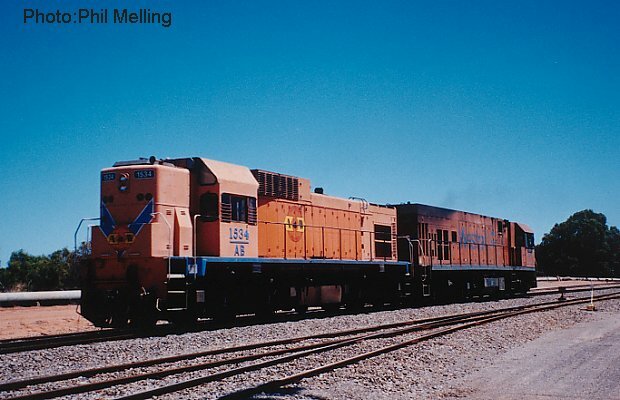 AA1517+P2008 power along with an empty grain on 14 February 1998 heading for Narngulu. 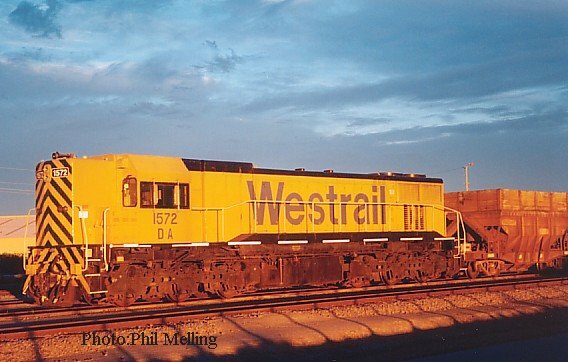 The then Westrail crews swap trains at the Geraldton Port. AA1515+AB1536 are on a loaded grain, P2003+P2008 are at the head of an empty grain train, the two P class were coupled together for an extended period due to collision damage incurred in the Great Southern. 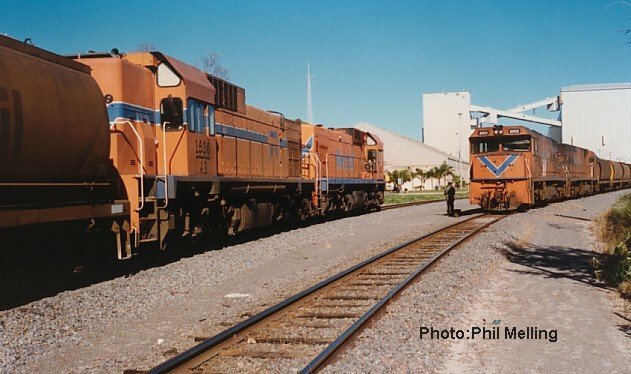 Both units were eventually overhauled.Photo taken on 11 August 1996. 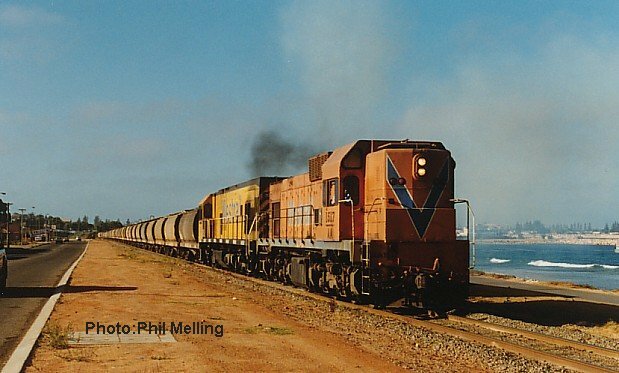 AB1534 leads P2017 back to the Narngulu fuelling point after cutting off of the coal train on 24 February 2002. The extra unit (the AB) was utilised to assist the P with the additional grain wagons on the train. I was aware that DA1572 was to be used for brake tests on the Talc set on the 27 July 2001 and that the morning sun would be just about right. What I did not anticipate was 99% cloud cover in the early morning. As I drove to Narngulu there was just a thin patch of clear sky visible just as the sun cleared the hills. This photo was the result, 5 minutes later the sun had gone and it rained for most of the day. 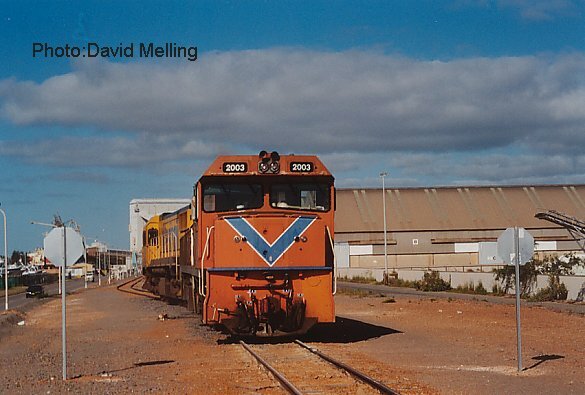 P2003&DA1576 running around at the Geraldton port as it had just finished unloading the Grain train. The photo was taken on the 15 of September 2001.